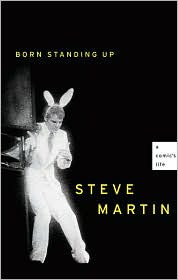 "Born Standing Up: A Comic's Life" is Steve Martin's new book release. It is a funny, sweet, personal, and well-written text. Those who enjoyed his play "Picasso at the Lapine Agile" and afterwards the novella "Shopgirl," will not be disappointed by "Born." In 1977 Maureen Orth observed the following about Martin: "If Woody Allen is the archetypal East Coast neurotic, Steve Martin is the ultimate West Coast wacko." Well, the "West Coast wacko" has come a long away. While some of his recent cinematic choices leave something to be desired, the literary Martin continues to deliver. And thank goodness he is not satisfied with such movies as "Cheaper by the Dozen 1 & 2." Keep that keyboard active, Steve! A pensive Martin is an enjoyable Martin.